Amethyst is a variety of quartz and owes its purple color to the presence of iron. It is composed of silicone dioxide SiO2. It has a hardness of 7 on the Mohs Scale and is transparent to translucent. The color of amethyst is heat sensitive. It will turn yellow when exposed to heat. 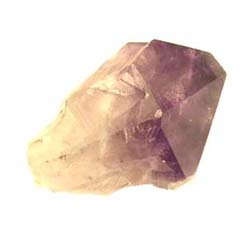 Commercially available citrine is often amethyst that has been heat treated. Amethyst has had a universal appeal throughout history and in many cultures, both for its beauty and its spiritual properties. At one time it was valued with the most precious gemstones: diamond, sapphire, ruby and emerald. In more recent times it has lost much of its value due to the discovery of extensive deposits in Brazil. Though Brazil produces most of the world’s amethyst, the crystal from Uruguay has richer color and is sought after by both jewelers and collectors. 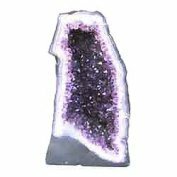 Known as the sobriety stone and associated with the Greek god Dionysus, amethyst is recognized for its general calming affect. The Greeks and Romans carved wine goblets from amethyst, believing that it could prevent intoxication.